Cystitis- How Can You Help? Today’s blog was written by our ‘tame’ vet student Joanna Woodnutt. Jo is a final year vet student who fosters for us and has an interest in preventative healthcare. ‘Cystitis’ translates as ‘inflammation of the bladder’, and is a common problem in cats. It is not always an accurate term- often cats have inflammation of their urethra, rather than their bladder. This is why vets prefer to call it Feline Lower Urinary Tract Disease, or FLUTD, as this is more accurate- it is an umbrella term for many of the cystitis-like symptoms that they are prone to. Unlike many other animals, feline cystitis is rarely bacterial and is in fact idiopathic- that is, the cause is unknown. It is likely to be stress-related and involves the urethra becoming inflamed. Since the urethra is a tube, this can make it very difficult to pass urine, and since it is inflamed, the urine can make the urethra more sore, causing it to become more inflamed- and the cycle starts again. How will I know if my cat has it? Cats with FLUTD will visit their litter tray little and often. They will be able to hold less urine in their bladder before they need to go, and it will be painful to go, meaning they may yowl or strain in the tray. For those cats that do all their business outdoors, it can be hard to spot these problems developing, but you may notice they have ‘accidents’ indoors. You may see them in the garden squatting again and again. Sometimes they will have blood in their urine as well. If you have a cat that doesn’t seem to be passing any urine at all it is extremely important that you take them to the vets, as this is an emergency situation and the longer that it is left the poorer the prognosis. The only way to be sure your cat has FLUTD is to take it to the vets. If you can, take a urine sample with you as this will help the vet to work out what is going on. 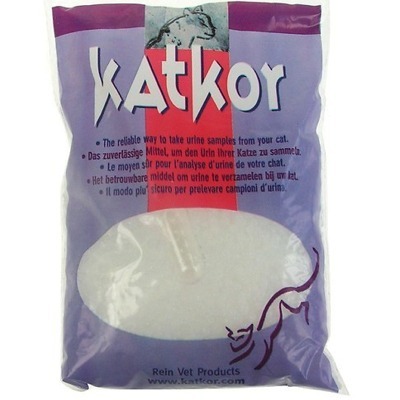 Vets and some pet shops will stock a non-absorbant sterile cat litter such as ‘Katkor’ that can be used in the litter tray to obtain a urine sample. They even come with a urine pot! What will my vet do about it? First, the vet will need to examine the urine to be sure your cat has an inflammation, and to check that there is no underlying cause such as bladder stones or bacteria. Usually, there isn’t, and after an assessment of your cat’s health, the vet may give your cat meloxicam. This is an anti-inflammatory pain relief drug that will take down the inflammation in the urethra and allow the cat to urinate properly again. It is really easy to use as it is a liquid that can be poured onto food or squirted straight into the mouth. How can I prevent it happening again? 1. Overweight cats are at a higher risk of FLUTD. Whilst you’re at the vets, ask about your cat’s weight and make sure it is where it should be. 2. Less active cats are at a higher risk of FLUTD, so use toys to engage your cat and encourage them to exercise. 3. Stress is often a precursor for a FLUTD episode. This includes changes in routine, but also accounts for the prevalence of FLUTD in multi-cat households. Try to ensure any changes in routine, foods, and even cat litter are made slowly so as not to stress your cat. 4. Encourage your cat to drink plenty of water so that the urine is more dilute and less toxic to the urethra. You can do this by placing multiple water bowls, investing in a drinking fountain, or wetting their food a little. 5. Depending on the cause of the flare-up, your vet might suggest a presciption diet. These have carefully controlled minerals to reduce the production of urinary stones. ← Early Neutering- Is It Safe?